In Zombie Survival, you choose your provisions to survive a zombie apocalypse. Each player selects items to place in their house, including weapons, lumber, gas, first aid, etc. I love zombies, so when i won this game at a convention i was excited. When i saw the pieces and started to pop out the pieces included with the game, my excitement was off the charts! However, once i started to read the rule book that all went out the window, and in came frustration. The instructions for this game are atrocious, like the worst i’ve ever seen in a game. The first game i played two of my friends got into an argument over one of the rules which is not addressed well and were legitimately angry. The second time i played me and my girlfriend got into a fight, about something in the game which we interpreted differently. The terrible thing about the rule book is that it bogs down an ambitious game that is not bad. The game breaks down into 2 parts, preparing for the zombie apocalypse and then trying to outlast your neighbors. No one wins, but someone survives longer and “Wins”. When preparing for the apocalypse the players pick from items they must be able to fit into their house items range from weapons, flashlights, food, survivors, cars, generators and more. Everything you get has pros and cons, more survivors means more actions per turn, but it also means more food and water consumed every turn. A car is great for going into town to get more supplies, however going into town leaves your home much more vulnerable to zombie attacks. Instead of a standard board, everyone gets their own board which has a house and yards on all sides. Once your house is full the zombie outbreak occurs. At the beginning of every turn a card is drawn by the dealer some are good *Another survivor arrives with food* and most are bad *Your house is on fire*. 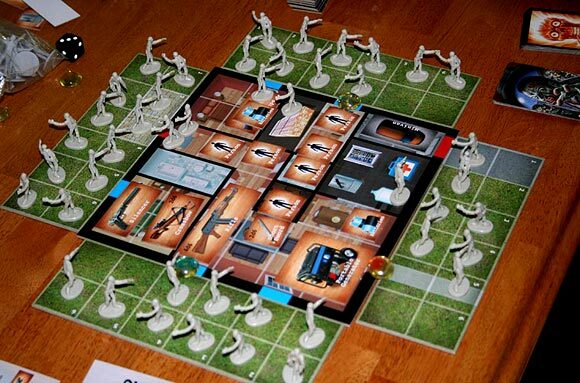 During players turns they use their actions to do a number of things which are barricading their house, killing zombies, going into town, and placing zombies on other peoples yards. The last player alive wins. Overall, i really wanted to like this game and i do, to a degree. However, if i paid for this game my opinion would probably be different. So the goods of the game, it looks cool, the pieces, zombie minis, and idea are good. The bads: The instruction booklet, to hard, LONG set up time, not enough event cards, a couple misprints on the game board and cheat sheets *Doesnt impact game play*, needs more items * Especially silenced weapons and short range weapons*. In conclusion, don’t buy this game unless its dirt cheap and/or your an avid collector, but don’t be afraid to give it a try. So the zombie plague has infiltrated suburbia! Now we’re holed up in our suburban houses and need to hunker down and hold off the encroaching zombie hordes. Gather supplies and arms and gas up yer mini van if you can to fetch supplies in town! What could be a cooler scenario? Don’t get me wrong, I’m a huge fan of Twilight Creations. I love the Zombies!! !, Humans!!! and Martians!!! series of games and own all of them including the expansions. When purchasing any of these titles you know what you’re getting but Zombie Survival was a huge let down for me in the production area. Not the best looking components and the tiny zombies… well just nitpicking I suppose. That aside, the rule book has to be about the worst I’ve seen. Maybe I just don’t get it. Crazy long set-up time and poor rules equal a really tough time. I wanted to love this game but hated almost every minute of it. I will give it another go though and if anyone has any suggestions please let me know. This game was a very hard sell to my game group after the first set-up and the first play through left us referring to the rule book way too many times. I’m all about supporting a company like Twilight Creations because they were my “gateway” company with the game Zombies!!! but in this day and age with the internet…and this goes to ALL GAME PUBLISHERS… PLEASE make use of the internet and publish a Video Walk-through of the rules and game play! No brainer in my opinion. I might love this game if that option was available. 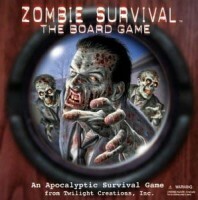 Add a Review for "Zombie Survival: The Board Game"